Anyone who has taken on the duty of house-sitting for a neighbor over summer vacation in New Orleans has received the instructions to feed the inside animals and the outside animals. It’s part of our ‘culture’ here that makes us rather Third World. It can make living here extra difficult since there are more animals in our environment than most cities. 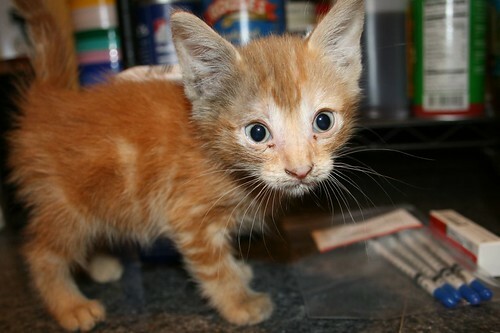 Sullivan is a yard kitten who needed some help. He told me he needed to go to the vet. So I took him. He appeared one day with 3 other kittens, seemingly out of nowhere. I was able to start touching Sullivan because he and his brindled sister had these bad weepy eyes and were rather blind. I grabbed them and started wiping their eyes every couple of days so they could see their food. Soon, Sullivan realized that I wasn’t going to hurt him and he was very vocal and kept coming to me. He’s very sweet and affectionate. Perhaps it appears to readers that I am constantly doing good deeds but I am not at all coyly philanthropic. I like sleeping and am rather introverted overall. However, it seems I am constantly confronted with problems in New Orleans and I am mostly tired of them. However, if I can do anything to relieve some suffering, I am simply unable to ignore it. So I took Sullivan and his brindled sister to the vet because he was crying to me daily and she was getting lethargic and my friends Emily and Brian have set a good example for me about going the extra inch for animals, so I had to do the right thing for these kittens. Sullivan made it through the vet’s examination with a clean bill of health but his sister, sadly, did not. Since I spent a bunch of money I do not have on these animals, Sullivan was named and soon after I began putting Sullivan’s photos up on Flickr. 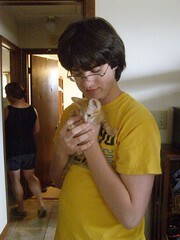 One day, my friend Randall, whom I met through Karen at Squandered Heritage said he’d like to adopt Sullivan. I was shocked at this good news. I thought I had finally gotten in over my head on good deeds. But Randall came to the rescue! Randall is a kitty hero! I named Sullivan after Louis Sullivan, one of my most favorite Chicago architects. Sullivan’s story has a happy ending, he’s doing great over at Randall’s and he’s going to come back and stay with us while his family goes on vacation. This story has a happy ending but the stray animal population is exploding in New Orleans again and we must do something about it. I contacted theSouthern Animal Foundation to take Sullivan there but they were booked. You can trap the wild cats in our yard and rent the traps for a refundable $50 fee and they offer very cheap spay and neutering services on certain days of the week. I want to thank Dr. Amy and her staff at Magazine Street Animal Clinic for taking Sullivan and keeping him overnight on short notice so that he could get healthy again. I always notice an explosion of pets, sadly, when the college term ends.